You can start taking distributions from your IRA without paying a penalty tax when you reach age 59 1/2, but the amount you withdraw is subject to income taxes in most cases. Your annual distributions are included in the calculation of your total taxable income for that year. The same rules do not apply to Roth IRAs, which are quite different types of retirement accounts. Contributions made to a traditional IRA use pretax dollars. Roth contributions are made with posttax dollars—an important distinction. You've already paid income tax on that income in the year you earned it. You can, therefore, take distributions from your Roth IRA tax-free. The Internal Revenue Service won't tax you twice on the money you contribute to a Roth IRA, although you do have to maintain the account for at least five years and, as with traditional IRAs, you must be at least age 59 1/2 before you take distributions to avoid a penalty. Even before age 59 1/2, you can take back your principal contributions as long as you don't touch any investment gains. The total amount of tax you pay on your annual traditional IRA distributions depends on your overall income and the deductions you can claim that year. There used to be a line on the 2017 Form 1040 labeled “IRA distributions.” You could segregate and enter the amount of IRA funds you withdrew on this line. It probably will not appear here in the same place the 2018 return. The Internal Revenue Service, in cooperation with the Department of Treasury, has completely revised the old 1040 to accommodate the many tax law changes resulting from the Tax Cuts and Jobs Act (TCJA) in 2018. The new form is said to be simpler—it's less than one page—but don't be fooled. 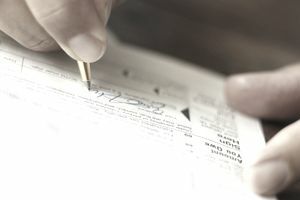 You must still include all the same information on your tax return as you did in years past, but you'll input a great deal of it on additional forms and schedules. You must still report your IRA distributions in 2018, but you most likely won't do so in the same place. The good news is that you won't have to worry about this if you use tax preparation software or hire a tax professional to prepare your return. Both know where to enter the appropriate information. Add your IRA distributions to your other sources of income to determine your adjusted gross income (AGI) for the year. Your AGI is then reduced by allowable deductions and exemptions, and the result is your taxable income. Your IRA tax rate is, therefore, your effective tax rate for that year. If you have high income and very few deductions, you can expect to pay more tax on your IRA distribution than someone who has less income and more deductions. As of 2018, the penalty tax is 10 percent if you take a distribution before you reached age 59 1/2. You'll have to pay this in addition to income tax unless you qualify for an exception. Allowable exceptions include transferring the funds to a spouse under the terms of a divorce decree or using the money toward qualified education expenses. You can also use the money without penalty to purchase your first home. Other exemptions include disability, the death of the owner, unreimbursed medical expenses, and a call to duty if you're a military reservist. You can also avoid the penalty if you "undo" your contribution and take it back before that year's extended due date for your tax return. This move, however, would mean more taxable income to you in that year. You can't claim a tax deduction for the reclaimed contribution. You can't take distributions too early, nor can you sit on your IRA and leave it untouched, growing and gaining forever. You must typically begin taking required minimum distributions (RMDs) when you reach age 70 1/2. IRS rules pinpoint exactly how much of a distribution you must take each year depending on factors unique to your circumstances. The penalty is even heftier than the 10 percent early withdrawal penalty if you fail to do so: 50 percent of the amount you were supposed to take. You can begin taking RMDs early to spread the tax hit out over more years. Nothing says you have to wait to age 70 1/2. You just don't want to do it before you reach age 59 1/2. What Happens If You Move Funds From a 401(k)? You can move funds into an IRA through a process called a rollover if you have money in a 401(k). The funds for an IRA rollover aren't taxed when they're moved from the 401(k) plan because they go from one qualified tax-deferred retirement account to another. Rollover transactions have specific rollover rules, but you won't trigger any tax liability if the funds go directly from your 401(k) to the new IRA financial custodian and if you never take possession of the money. Funds can also be rolled over from one IRA to another if the money goes directly from the first plan's trustee to the second plan's trustee. You can't ever have possession of the funds. If you do, you have 60 days to reinvest the money in a new IRA to avoid taxation of the amount, and you can only do this once a year. Mona, a single individual who is 65 years old, needs IRA withdrawals to cover her living expenses. She must take $2,500 a month. In addition to this $30,000 in IRA distributions annually—12 times $2,500—Mona will also have additional income of $12,000 from her pension, giving her an adjusted gross income (AGI) of $42,000 for the year. This assumes that she cannot take any adjustments to income to reduce that amount. Mona doesn't itemize but elects to claim the standard deduction instead—$12,000 for a single taxpayer in 2018. Subtracting this amount from her AGI leaves her with $30,000 in taxable income. The first $9,525 of a single taxpayer's income is taxed at 10 percent in 2018. Mona's taxable income from $9,526 to $38,700 is taxed at a 12 percent rate. Consequently, Mona will pay $3,409.50 in taxes: $952.50 on the first $9,525, plus $2,457 on the balance. If Mona had any taxes withheld from her IRA distributions and pension distributions, she might have paid enough in taxes throughout the year to cover this amount. Otherwise, she'll be writing a check on April 15.